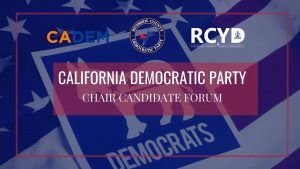 On Monday, March 11th, the RCDP, the Riverside County Young Democrats, and Riverside County Democratic Clubs, hosted a Candidate Forum for the candidates running in the California Democratic Party Chair election. Candidates Daraka Larimore-Hall, Rusty Hicks, Lenore Albert participated as well as Jocelyn Sida who represented Kimberly Ellis. The candidates shared their visions for the Democratic Party and why they are best suited for the job. 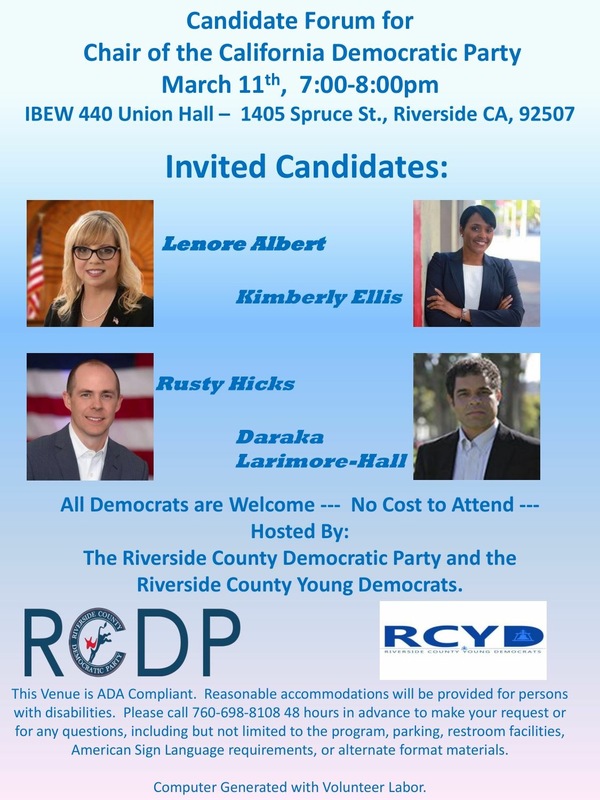 For those who were unable to attend in person, Riverside County Young Democrats provided a live streamed a Facebook Live feed. Click here to see video. Do you support the Green New Deal, including its job guarantee? How many conventions have you been to? What are the salaries of the top 3 CDP officials? What if any solution do you have regarding the homeless epidemic? How do you feel about reparations? Kimberly Ellis provided the following answers… Click here to see answers.